S-Works is great but you don't have to empty your wallet in order to experience the same level of fun. The difference between the Stumpjumper Comp Alloy and the Comp Carbon is the Fact 11m chassis and rear-end that you will find being used on the S-Works model. You will find 150mm of travel at the front provided through the Fox 34 rhythm fork which helps to boost handling and adjustability, ready for whatever your route has to throw at you. 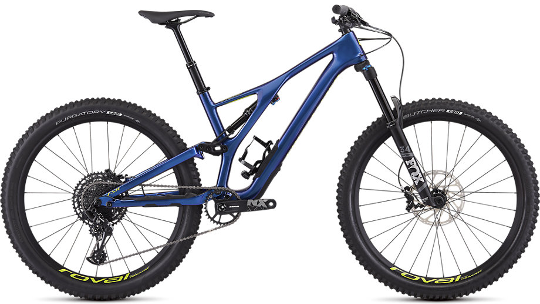 The Stumpjumper has served as the go-to Moutain Bike since the Tri Store set up in 2003 and in its 37th year of development, it remains as revolutionary as the first production mountain bike released in 1981. Finally, Specialized have revamped the Stumpjumpers drivetrain kitting it out with the latest 12-speed SRAM NX Eagle groupset which ensures you can go further, faster and higher than ever before. Don't worry, S-Works doesn't get to have all of the fun—the new Stumpjumper Comp Carbon 27.5 features the same frame with a full 11m carbon chassis and rear-end as its older brother, but with a solid list of no-fuss components for an everyman's budget. The FOX DPS Performance rear shock features Rx Trail Tune, ensuring that no matter the wheel or frame size, your bike is dialled-in perfectly. A FOX 34 Rhythm fork handles suspension duties up front, with stiff stanchions and plenty of adjustabilities. Front Tyre - Butcher, GRID casing, GRIPTON® compound, 2Bliss Ready, 27.5 x 2.6"
Rear Tyre - Purgatory, GRID casing, GRIPTON® compound, 2Bliss Ready, 27.5 x 2.6"